Google Analytics introduced Visitors Flow last week, a tool for creating interactive flow graphs that represent how visitors “flow” through your website. 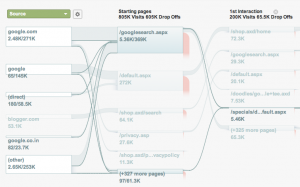 These convenient visualisations of the Visitor Path report make it much easier to segment user behaviour and optimise the visitor experience. 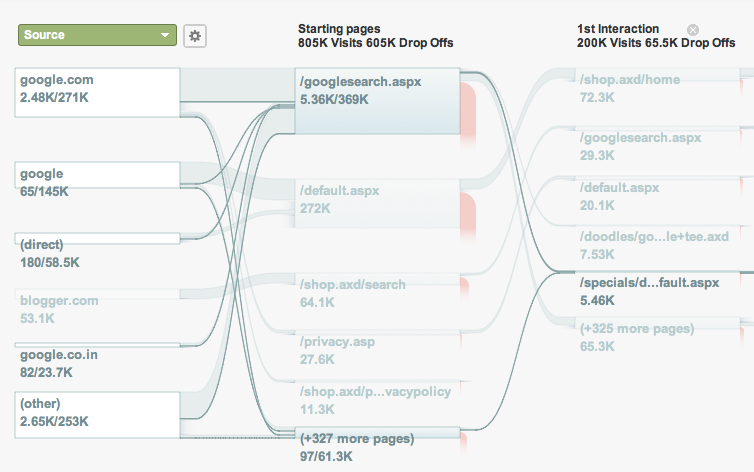 Another tool added was Goal Flow, which does the same thing with your website’s goals. Visitors Flow creates flow graphs that represent your number of visitors across a given time period, how they entered and exited your website, and where they clicked to navigate from page to page. The graphs can be particularly useful for analysing and reducing your bounce and exit rates. This feature allows you to answer important questions about the success of your online marketing efforts. For instance, if you were wondering how engaged your visitors were by a promotional landing page, you can find out using flow visualisations. This can also be applied to questions about levels of visitor engagement with your website as a whole. Goal Flow is available if you have set goals in Google Analytics. It graphically represents the path visitors took to complete a conversion, and where along the conversion funnel they dropped off. Currently, only URL destination goals are supported in Analytics, however, Google will soon be adding events and other possible goal types. For those without a current goal or goal funnels already defined, you can still create a new goal or goal funnel and check it out straight away, since the tool works backwards on your historical data. For more information on how to use Goal Flow Visualisation click here.